How far along: 30 weeks - time is flying by! I can't believe we have less than 10 weeks left until my due date! Baby is the size of: a butternut squash. She is about 17 inches long and weight around 3 to 3.5 lbs. From here on out we can expect that she will gain about half a pound a week for the next several weeks. She is now able to regulate her own body temperature, so she'll start shedding lanugo (the downy body hair that's been keeping her warm) soon. Symptoms: I'm definitely feeling large these days! I'm just dealing with normal pregnancy back pain and SPD. I'm also noticing more swelling in my hands and feet at night. My rings slip on easily in the mornings, but they start getting tight by the afternoon. My belly button is also starting to get really shallow. I have a feeling it's going to pop out before too long! Also, last week I mentioned that I failed the one hour glucose screening. I'm happy to report that I took the three hour test last Thursday and passed with flying colors! Hooray! Movement: I'm feeling less sporadic kicks and a lot more wave like movement this week. I can tell that she is growing quickly in there! I also felt her hiccuping for the first time last Thursday. Steven had to be at work early that day, and I woke up while he was getting ready. I rolled over and started feeling this rhythmic fluttering in my lower belly. After a few seconds I realized what I was feeling was baby girl hiccuping! Nursery: Slowly but surely progress is being made in her room. We have all the big items ready to go, so now starts the decorating! I'm hoping to have it finished up by the end of the month. You can see her nursery inspiration here. Labor Signs: Nothing, thank goodness! Sleep: Remember how last week I said that I was incredibly lucky because I haven't had to get up in the middle of the night for a potty break? Well I must have jinxed myself because I've gotten up during the night several times since making that statement. Thankfully I'm able to fall right back to sleep. The worst part of sleep has been waking up the next morning. My legs, hips, and pelvic bone are so sore as soon as I wake up. It takes a bit longer to get up and get moving these days, but once I start moving around the pain subsides. Best moment this week: Putting out fall decorations on Sunday. My house now smells like pumpkin spice, and it's delightful! I know it's still early, but I couldn't help myself!! Missing anything: Wine and sleeping on my back and stomach. Cravings/Aversions: Yesterday I realllllly wanted a slushy and that craving is still lingering today. Other than that, it's still the same ole' thing. I've tried incorporating chicken back into my diet. Some days it's a hit, but most days it's still a miss. Mood: Anxious for the next 9 and a half weeks to fly by. I'm excited to meet my girl! Looking forward to: Football season! This weekend marks the start of college football season, and I can't wait! Baby girl already has a stockpile of game day outfits thanks to her Alabama football loving mama and her family and Tennessee football loving daddy and his family. I already have plans to pack an Alabama outfit and Tennessee outfit in my hospital bag, just in case we are there during football Saturday. Husband is: Working hard to prepare for his baby girl's arrival! New mommy question: Nothing new this week. Eeee!! 10 weeks to go!!! I feel like you just announced you were pregnant! 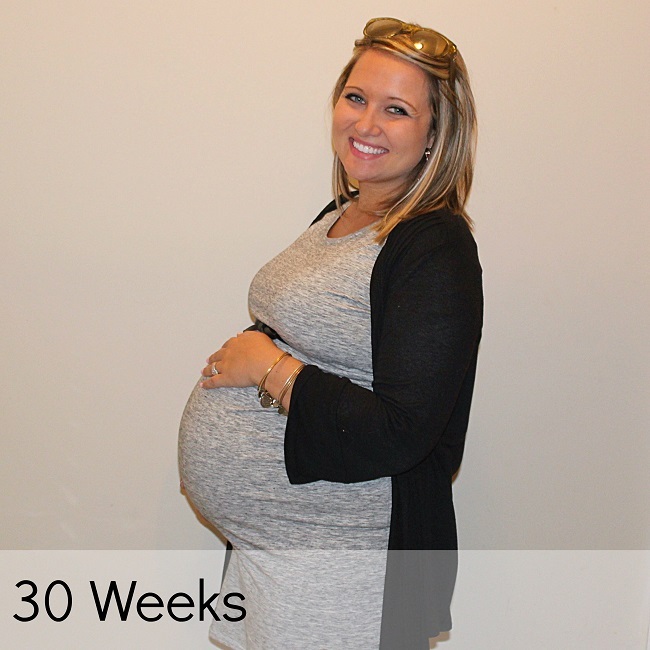 30 weeks still seems so far off for me...but it's really not- and that blows my mind! Glad you passed the 3 hour test! Wohoo! 30 weeks!! Hang in there with the SPD and back pain, it's all temporary :) She'll be here before you know it. I feel like those last weeks fly by. Girl, get yourself a slushy!!! You have some celebrating to do for passing that test anyways :) I am so ready for football this weekend!!!! It will be interesting to see which team she sides with once she is able to. Then she is going to obviously ask you why you ever put her in that hideous shade of orange :) Hehe! I can't believe you're 30 weeks already!! I feel like it's just flying by!! And of course you look absolutely gorgeous, as usual!! Hooray for passing the test!! You still need to come and meet Mr. Sheffield! !